Still blurry-eyed these two lovebirds seem to have made a remarkable transformation. He has somehow grown a lower hairline and managed to place a cleft in his astoundingly chiseled chin, while she has turned into a minor Hollywood celebrity showing off her dress on the red carpet. Well done guys, your 100 day transformation is complete. 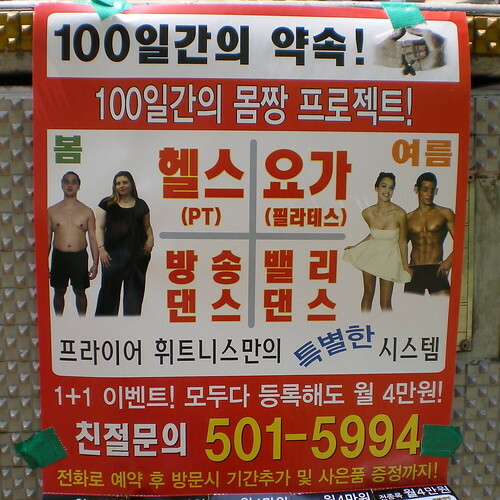 I've seen similar posters down here in Daegu. Apparently a week at the 'hellsuh kuhlub' with make you skinny, muscular and white.